Doctors warn people all the time about the dangers of alcohol, and most folks are aware that loud events such as concerts can damage your hearing. But did you know the two in combination create a situation in which the dangers are multiplied? Think twice before moving closer to the stage without ear protection. Alcohol lowers people’s inhibitions, and causes them to make decisions they may not make when they’re sober. Taking a dare, staying out longer than usual, and engaging in risky behavior are not unusual events when drinking is involved. Alcohol consumption in and of itself can also damage hearing. Research shows that excessive drinking may shrink the brain and destroy the auditory cortex that processes sounds. In short, people who drink excessively over long periods may have ears that work perfectly fine, but minds that don’t process sound signals properly. Heavy drinking over long periods may also lead to damage to the delicate hair cells in the ears that help transmit signals to the brain. A critical part of hearing in the cochlea in the inner ear. The cochlea is shaped like a snail, and it is surrounded by about 16,000 tiny hairs called cilia that capture and transmit sound signals. Once these cilia that are so critical to hearing become damaged and die, they are lost forever. Loud noises even in the short term can cause damage to the membranes and cells of the cochlea. Long-term exposure to loud noise causes the cilia to work too hard, at which time they start to wither and die. Hearing loss caused by this type of damage is rarely reversible. 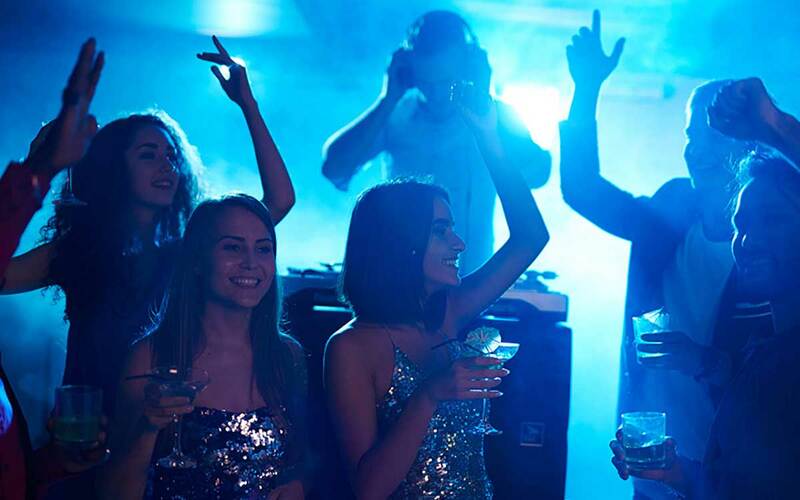 It’s no surprise that since alcohol consumption and loud noise both can both lead to hearing loss that the two together is a dangerous mixture. The problem goes beyond their individual contributions. A study from the Netherlands showed that because alcohol lowered inhibitions, people at a concert who were drunk moved even closer to the loudspeakers. The closer you move to the speakers, the higher the dangerous decibel levels that reach your sensitive inner ears. Some of the study participants wore earplugs, and they displayed lower levels of short-term hearing loss and tinnitus (ringing in the ears) than did those who did not wear ear protection. Other research has pointed to what is known as the “cocktail party” effect when people combine alcohol with loud settings. Researchers in London found that the longer people drank and stayed at a party the more difficulty they had with hearing at low frequencies. Most speech is made up of sounds from these low frequencies. Given this difficulty that was partly caused by alcohol, people over time started talking louder to be understood, raising the noise levels even higher. You’ve likely experienced this phenomenon yourself. Decibel levels continue to rise when everyone at a party or a bar starts talking louder to be heard over the cumulative effect of others. You’re in even more trouble if the host or bartender then turns up the music so you can listen to it over the loud conversation. More research is needed to find the exact connections between alcohol, noise, and hearing loss, but there are some simple precautions you can take to protect your hearing. Be sure to wear earplugs when attending a loud concert or another event. People in the study mentioned above in the Netherlands reported enjoying the concert more when wearing ear protection. If you find yourself in the middle of a very loud conversation at a party or a bar, consider moving to a different area. There is no need to shut down your social life completely, just make sure that you take precautions so that down the road you don’t experience hearing loss that makes social situations more difficult.